In the scheme of things, this is a very minor annoyance. But one of my neighbors always parks The Truck in front of my house. On my block, street parking space is at a premium. There isn’t room in front of most houses for more than one car. In front of my house to the left of the driveway, there’s room for 1-1/2 cars. That’s it. To the right, there isn’t enough room between my driveway and my neighbors driveway to comfortably fit a car. You can put a car there, but only if it hangs over into one of the driveways. So that’s where we put garbage and recycling on collection day. Most people have more than one car and park them in their driveways. Although all of the garages are advertised as double car, in reality the house on the corner is the only garage that’s really big enough for two cars considering that most people, like this intrepid reporter, also use the garage for storage space. I like to park my car in the garage. It slots in nicely right in the middle, with stuff to either side. So parking another car in the driveway makes it impossible to get my car out. When #1 Son lived at home, he parked in the garage when I wasn’t home and didn’t catch him at it, and parked in front of the house otherwise. When he moved out, The Truck took over. I have no idea which neighbor owns The Truck, because I have never seen anyone actually drive it. Sometimes it is gone. Mostly it is there. It’s usually only a minor annoyance because visitors – and I don’t have that many – can park in my driveway. It has, over the months, attained the status of capitalization. It’s not just some old truck. It’s The Truck. I sort of wish The Truck were a slightly more upscale vehicle (we’re talking old and well used, here). But it does give my house the appearance of being lived in when I’m away. So when I see it in front of my house, I sigh and go on. Now #1 Son is out of town for 5 weeks and his car is living at my house. I insisted it live at my house because there have been issues with his car when he leaves it elsewhere — minor things like it being towed necessitating Mom bailing it out. Since my name is still on the title, it lives with me, now, when he is not using it. The question, of course, has been… where to put it. Not the driveway, because then I can’t get my car out without moving his. Not in front of my house, because The Truck is there. Not elsewhere on the street, because all the places on the block are taken. In the end, he parked it in the tiny space between the driveways, with its rear poking out into my driveway. I’m sure it annoyed my neighbors, because it meant they had to move their garbage/recycling. (Sorry about that, neighbors!) But there just wasn’t anywhere else to put it. So there it was. #1 Son left Monday. And the game began. I watched for The Truck to disappear. Even it it was only briefly. Just long enough to move #1 Son’s car back a bit to the other side of the driveway. Just a few minutes. Every time I went to the front of the house, I looked out the window. Was it there? Yes. Every time I left, I looked. Every time I returned, I looked. It was there. I began to think it was a permanent fixture. I started looking out only half-heartedly, knowing that The.Truck.Would.Be.There. Late last night I looked outside. The scene looked different. The.Truck.Was.Gone! The picture is the scene now. 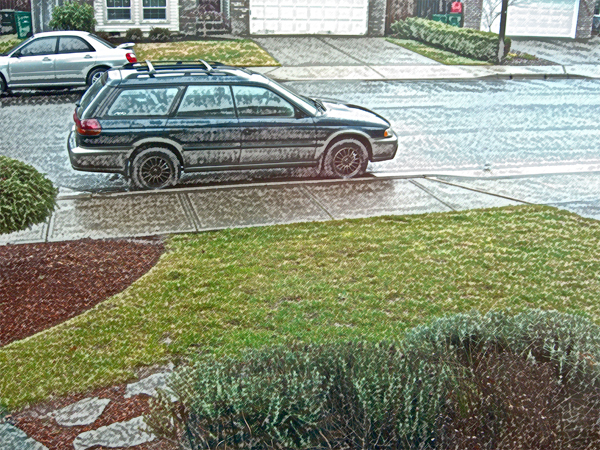 #1 Son’s car is parked in front of my house. Ahhhhhh… sigh of relief. And there it can sit because I’m not driving it. It looks about like his room inside — toxic waste dump. I have not heard from #1 Son yet. But I’m sure he’s OK and got to Brazil safely. If not, I’d surely hear from the State Department or someone, right? I’m sure he’s ok! Sometimes no news is good news, although that doesn’t help a mother feel better. I hate when other people park in front of my house. I do not want to look out my front window and see someone else’s car. That’s my space, not theirs! Here’s to reclaiming your space! I’m glad to know I’m not the only one. I laaaaaaughed when I read this!!! I used to live in upstate NY and we would wait in hiding for street parking like we were urban hunters–tracking prey and hiding in blind spots. Some so-and-so would always camp in the best spaces…sometimes for weeks! Congratulations on your ‘capture’! Where did the Truck go? I’m in NJ suburbia, and last year a car would regularly park directly opposite my driveway. This person had an entire street to park on, but there that car was, every day. Finally I put a gently-worded note on the windshield. And then the car vanished. Might be related to the Truck. And gravel trucks which over time spread from his three car driveway to lining the quiet expanse of every parking space within 1500 feet of his newly purchased home. First it started with him parking his vehicles in the spaces where my kids parked following a day of college class work. Then he graduated to taking the place where my college coed was accustomed to parking on weekends. Being the forward single protectorate parent I am, I marched right up to his front door and explained, politely, that those places had already been taken. It was as though his male testosterone driven need to imperialize and take over became even more fervent, until, on a regular basis, he parked his semi-sized flat bed orange colored, diesel fueled giantâ€”uglyâ€”monstrosity directly behind my home on an easement from my home to my neighbors back entrance. From my breakfast patio, for at least two years by then, I had been enjoying a quiet morning coffee commune with fawning deer, birds, squirrels, frogs, dragonflies, and my three happy cats romping about in the freshly fallen or decaying leaves (depending on the season). From my deck perch I could behold the foliage, flower and frost of the season, starting each of my days with vigor, valor and a sensibility, that once again, I could face my life. Then, the orange diesel glutton appeared, always there, like a taught, a message, â€œI can spread out my mechanical world far and wide. At first I was polite. I asked kindly if he would consider parking somewhere else, he did not do so. Finally, I looked up the Oregon statutes on â€œthe right of quiet enjoyment of oneâ€™s premisesâ€ and wrote down the statute, left it in a plastic bag, in case it rained in the night, and gave him notice I was giving him 24 hours to remove his obstruction, or I would avail myself of the right to have his property towed away at his own expenseâ€”and would do so on any future occasion he parked his monstrosity on my property. Within hours the monstrosity was relocated to an address far beyond my awareness and I never saw it with my own eyes again. Personally. I think some people are just plain rude. Rude, selfish, self-centered, and pressing to foist their convenience on the king-of-heart; especially, when the kind of heart happens to be a single female. I have other stories of families and males who figured because I was a female head-of-household; they could use my landâ€”without consent. It is not fun to stand up for oneself. Itâ€™s makes enemies in the short run; in the long run, it holds both species of the human experience accountable. Post Script: The sons of women raising sons in the 70â€™s, 80â€™s and 90â€™s, have no knowledge of this sort testosteronal usageâ€¦. My sons-in-law would never think of this (Iâ€™ve tried it out on them). Though I cannot suggest ways ones might respond to this incredible rude behavior, I have only from my own experience to draw. And, if need be, Iâ€™d used it again. The Truck moved around the corner. No houses on that side face the side street so it is, in my way of thinking, an excellent place for The Truck to be relocated. Hopefully over the next 5 weeks it will learn to like its new abode. Well, if The Truck were actually on my property, I’d have no problem having the thing towed. But it is in the street where there is a public right of access. Way back when, before #1 Son was a driver and when I had only one car, the neighbor across the street used to park a car in front of my house because the neighborhood basket ball hoop was in front of his house. But he asked first. And if I asked him to move it, he graciously did so. Alas, those neighbors moved and The Truck came to roost. I still haven’t figured out which house it actually belongs to. But I really doubt that it has anything to do with me being either single or female. It’s just expedient. It’s the only usually vacant spot on the block. My Daughter parks her car in front of the our house. She took the time to mark where to park her car so that no one else could park there. She is right smack dab in the middle. Nothing irritates her more than coming home from work to find someone elses car in her spot. It is pretty amusing as the people who park here don’t speak English, so we couldn’t communicate with them if we tried.Her car has been parked perfectly for the last 2 weeks in front of the house denying anyone else access to parking there. I believe they finally get it! Now that’s just not fair! I want a prime spot over the next five weeks to see the anger and frustration on the part of the owner of THE.TRUCK. But, itâ€™s catchy!!! And, as I was picking up muster, it made me think of â€œpersistent illusionâ€ the queen of laceâ€”and why she likes it so much. It really is catchy, rhythmic, comforting, and beautiful.